Journey to Scotland to experience the land that inspired the Disney-Pixar film Brave. Expore the beautiful landscapes of Scotland. Marvel at the incredible architecture found throughout the country. Wander through ancient castles and ruins. Try your hand at a wee bit of weaving at Dovecot Studios. Kick up your heels with traditional music and dance. Explore the center's artful presentation of both facts and lore about the loch, and then make up your own mind whether the famous monster Nessie really exists! Board a motor launch for a trek across Loch Ness and hear the skipper's tales of hunting the legendary creature. Or feel a brisk breeze as you canoe across the dark blue waters, the great forested shores rising to either side. Step between the mysterious standing stones just as Merida does on her journey in Brave. Your guide reveals some of the scientific theories about the site, as well as the folklore surrounding how the stones came to be. Is that a wisp glimmering in the distance…? Welcome to wild Scotland! Rothiemurchus Estate is one of the greatest tracts of natural forest in Britain. Spend the morning riding the Highland ponies—just like Merida's mount in the Disney•Pixar film Brave. Ride over peaceful hills and heather moorlands, past stunning views of the Cairngorm mountain range. Later climb on a mountain bike and gently pedal past ancient landmarks embedded in the magnificent scenery. Your private guide shares tales of royal intrigue as you explore this famous fortress rumored to be haunted by its ill-fated inhabitants. Discover the surprising truth about Shakespeare's King Macbeth and marvel at the sumptuous décor of this stately castle where The Queen Mother herself was born. 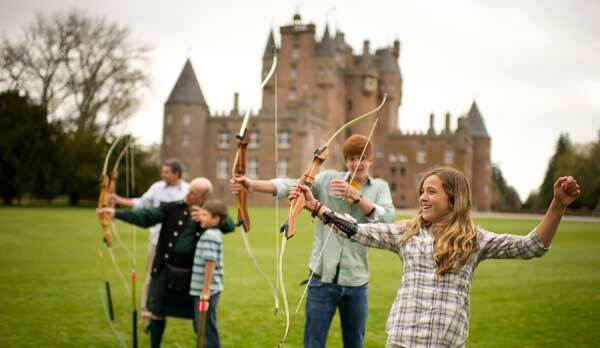 After the tour, join an expert on the castle grounds for a private archery lesson. Don't have a longbow and quill? Nae problem! All equipment is provided. Once the castle closes to the general public, join a guide for an exciting private tour of this magnificent monument. Be dazzled by the Scottish Crown Jewels, which were lost for over 100 years, and the Stone of Destiny, rumored to be Jacob's pillow from the Book of Genesis. This after-hours visit is a rare treat just for Adventures by Disney guests! After clearing customs, you are met by an Adventures by Disney representative who welcomes you with a warm "Fàilte to Scotland!" and then helps with your luggage. Relax as a driver whisks you away to the historic Waldorf Astoria Edinburgh – The Caledonian. Say halò to your fellow Adventurers at an exclusive feast in the hotel's elegant dining room. Raise a glass and toast the beginning of an unforgettable trip with a resounding "Slainte"! After a Scottish breakfast at the hotel, take a scenic walk around the city with a Blue Badge Guide pointing out the highlights. A Blue Badge Guide leads you on a tour of the royal palace, which is the Queen of England's official residence in Edinburgh. Over the centuries, great events at Holyroodhouse have shaped the fates of England, Scotland and France. Scotland's fierce struggles for power, love and family are all part of the history within. Climb aboard a motor coach for an excursion to Edinburgh Castle. There, take in the resplendent views of the city and explore the castle's massive fortifications. Revel in the remarkable tales told by your local expert of royal intrigue surrounding the wars for Scottish independence. While taking a walking tour of the neighborhood en route to the National Museum, make a stop at Greyfriars Kirkyard to see the statue of Greyfriars Bobby, the renowned Skye terrier. According to legend, this adorable pooch spent 14 years until his death guarding the grave of his owner. The story of Greyfriars Bobby was so remarkable that Walt Disney Productions turned it into a movie in 1961! Join your fellow Adventurers for an exclusive lunch in the Boardroom of the National Museum—with some of the best views of Edinburgh in the entire city. Take pictures of yourself and your family standing atop the National Museum, with romantic views of Edinburgh rooftops in the background. Experience tartan and kilt-making in this interactive activity that the whole family will enjoy. Meander through the museum at your leisure and take in the incredible collection of natural and cultural wonders. Edinburgh is rich in history and eye-catching architecture. Stroll the Royal Mile, the commercial center of Old Town, and hear the lilting melody of the Scottish brogue in passing conversations. You're sure to fall in love with this charming city as you explore the shops, restaurants and historic buildings of Lawnmarket and High Street. At dinner time, ask your Adventure Guides to recommend the perfect place to have a family meal. *Holyroodhouse Palace may be closed on some dates in June due to Elizabeth, Queen of England, being in residence. In the event the Palace is closed, a tour of St. Giles Cathedral and the Thistle Chapel will be featured. Fuel up on breakfast at the hotel before embarking on a journey by coach to one of the most famous islands of Scotland—the mystical, magical Isle of Skye. Travel across the Scottish West Highlands past some of the most magnificent scenery in the country! Scotland is rich with daring tales from the days of old. On your way to Skye, sit back and listen as your Adventure Guides tell tales of centuries past. Your journey takes you on the trail of Bonnie Prince Charlie, who raised his standard and began the Jacobite uprising in 1745 to reinstate the exiled Stuarts as rulers of Scotland. We'll pass through the rugged valley of Glen Coe, home to the infamous Massacre of Glen Coe in the late 17th century. The coach stops midway so you can take in the stunning natural beauty. Fort William thrives where the sea meets the Rivers Nevis and Lochy, with mighty Ben Nevis—the highest mountain in the British Isles—towering in the background. Spend a little time strolling the town's Highstreet before you sit down for a midday meal with your family. If you need a restaurant recommendation, feel free to ask your Adventure Guides. Make your way by coach to one of the most beautiful castles of Scotland! This majestic national icon sits at the dramatic junction of three great saltwater lochs. Take a self-guided tour to uncover the turbulent history of this extraordinary fortress that's been rebuilt several times over the centuries. 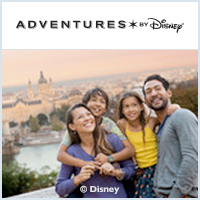 While adults eat at their leisure in the hotel restaurant, Junior Adventurers join the Adventure Guides for their own dinner shindig, then enjoy a private screening of a Disney movie. After breakfast at the hotel, board a coach for an unforgettable ride along scenic roads to Abhainn An Lethuillt beach. Take a guided hike along the beach trail and make a brief stop at Kilt Rock. Arrive by coach at the Quiraing Trailhead—surrounded by enchanting views of the shining waters, rugged shoreline and the endless sky embracing the horizon. Hike the Quiraing trail along grass-carpeted hills that reward you with jaw-dropping sights of the sparkling blue bay and the slopes that tumble past spectacular land formations. On a sunny day, you can see for miles across the waters to the mainland and Hebrides Islands. Enjoy a hearty lunch featuring delicious local fare at a restaurant on the Isle of Skye. Return to Portree and join a talented pastry chef to see how Scottish scones are made at this local village bakery! Try your hand at creating one of these buttery treats yourself. Set off for dinner on your own in this charming little seaside town! Fresh seafood, Scottish traditional cuisine and much more is on the menu at various excellent restaurants. Don't hesitate to ask your Adventure Guides for dining recommendations. Spend time on your own exploring the center, with its artful presentation of both facts and lore about the loch. Make up your own mind whether the famous monster, Nessie, really exists! Visit the art gallery or shop for a special souvenir of this legendary lake. Take a break from your Nessie hunt for lunch with your fellow Adventurers at this cozy café. Board a motor launch for a trek across Loch Ness and hear the skipper's tales of hunting the legendary creature lurking below. Or, feel a brisk breeze as you canoe across the famously dark waters, with great forested bluffs rising in either side. Relax as your Adventure Guides check you into this stylish new annex of the Kingsmills Hotel. Nestled in the countryside, these comfortable accommodations are your home for the next 2 nights. Discover a Scottish farm that's unlike any other! Dine and enjoy some interesting surprises, and while you are there see traditional Ceilidh dancing, take part in whiskey tasting and there's even Highland-themed games for the Junior Adventurers. Prepare for an overdose of adorable as you will not only get to see adult sheep and sheepdogs, but play with pups and lambs as well. Watch a demonstration of sheepherding from an award-winning Highland Shepherd and learn how to use a traditional sheepherding whistle—and take it home with you! Welcome to wild Scotland! Embark on a journey to Rothiemurchus Estate—one of the greatest tracts of natural forest in Britain. The ancient woodland forest is home to an extraordinary variety of wildlife, as well as pretty Loch an Eilein, with its 13th-century castle sitting on the lake's wee island. The glorious scenery will steal your heart if the mop-headed Highland cattle don't steal it first! Junior Adventurers will mount up and ride the Highland ponies over peaceful hills and heather moorlands, past stunning views of the Cairngorm mountain range. *Horseback riding activity is for Adventures 16 years and under and has a maximum weight limit for each rider of 200 lbs. (90.7 kg) Please note that this activity is not available on adults-only departures. Adult Adventurers will enjoy a tour of the magnificent Rothiemurchus Estate. Take a lunch break with your fellow Adventurers. Select a salad or sandwich from a menu that specializes in locally grown meats and produce, and admire the moss-laden Caledonian Forest. Join an expert on the estate grounds for a private lesson in archery. Don't have a bow and arrow handy? No problem! All equipment is provided. May the sure aim of Merida inspire you. Bid Soraidh to the Highlands with this evening at the Kingsmills Hotel, including the classic "Address to a Haggis"—a famous poem performed by a local bagpiper. Once defender of the Scottish crown jewels and fortress against the armies of Oliver Cromwell, this castle near Stonehaven perches on cliffs rising high above the vast blue sea, overlooking what was once a strategic merchant route during the Middle Ages. It was also an inspiration for Merida's castle in Brave! Explore the ruins on your own and learn about the castle's colorful past. Your tour of Scotland's historic castles continues as you travel by motor coach to Glamis Castle, whose grim history inspired one of Shakespeare's most renowned plays—Macbeth. You'll discover the surprising truth about King Macbeth and marvel at the sumptuous décor of this stately castle where the Queen Mother herself was born. After, enjoy a hot lunch from the castle's restaurant. *Edinburgh Castle may be closed on some dates in late July and August due to performances of the Military Tattoo. In the event the castle is unavailable, the dinner will take place at the historic Signet Library, home to the prestigious Society of Writers to Her Majesty's Signet. Say guid cheerio the nou to all your fellow Adventurers at this last breakfast in Edinburgh!